Astronomical Institute of the Slovak Academy of Sciences (AISAS) organises in cooperation with the US-SK Joint Research Project on Space Weather (US-SK project) led by prof. Dr. S.T. Wu (CSPAR, UAH, Huntsville, AL, USA) a closed (upon invitation) workshop on the topic of the solar flares and their relation to initialisation of the coronal mass ejections. Colleagues working in this branch of solar physics from the Central Europe region (Austria, Croatia, Czech republic, Hungary, Poland) and Slovakia (Bratislava, Rimavska Sobota, and Tatranska Lomnica) have been invited to participate at the workshop. Frame of the workshop is planned to be quite open. An intention is to hear oral presentations of almost all participants about their research and latest achievements in the field of solar flares and CMEs. A sufficient time is provided for these oral contributions. Attention will be taken to offer enough free time for questions and discussions during/after the oral presentation. Finally in the time schedule of the workshop special time will be devoted to be free for individual scientific discussions and networking activities. The workshop will be held on September 13-15, 2006 in the headquarters of the Astronomical Institute (AISAS) located very near the mountain spa Tatranska Lomnica (Slovakia) in the High Tatras mountains. Participants will be accommodated in the Guesthouse MARMOTA (known before as the SLOVNAFT pension) and hotel FORTON (formely hotel Energetik), located just ~700 meters from the headquarters, and some directly in the headquarters of AISAS. Accommodation is booked via the LOC of the workshop. This event is supported withing the frame of the US-SK Joint Research and Education Exchange Program covered by the National Science Foundation (NSF) (USA) and the Ministry of Education together with Slovak Academy of Sciences (Slovakia) paying travel and stay of the American participants. The AISAS will provide its facilities and coffee break refreshment for free. The participants are invited by the institute to the closing dinner free of charge. We are pleased to announce that there is no registration fee to the workshop. On Friday, Sept 15, the US Ambassador in Slovakia, R. M. Vallee, will visit the workshop for a couple of hours - breakfast with US participants, general welcome with all workshop particinants, meeting with the press, and visit of the high-altitude observatories are on the schedule of his visit. Slovakia: Elena Dzifcakova, Alena Kulinova (Astronomy, Physics of the Earth and Meteorology Department, Faculty of Mathematics, Physics and Informatics, Comenius University, Bratislava); Pavol Rapavy, Daniela Rapava (Rimavska Sobota Observatory); Peter Gomory, Lubomir Klocok, Ales Kucera, Milan Minarovjech, Vojtech Rusin, Jan Rybak, Julius Sykora, Oliver Strbak, Frantisek Tomasz (AISAS). In total: 36 contributions - 9 longer talks (30+10min), 21 shorter contributions (15+5min), and 6 posters. 37 participants from 7 countries. Workshop will take place in the large lecture hall of the institute headquarters on the first floor. Posters will be placed on the nearby wall. Coffee breaks will be served in the entrance hall of the institute on the ground floor. Meeting room is located just near the lecture hall. Hotel Forton and guesthouse Marmota are located ~700m from the institute headquarters. Headquarters itself is located at about 1km from the center of the Tatranska Lomnica village. 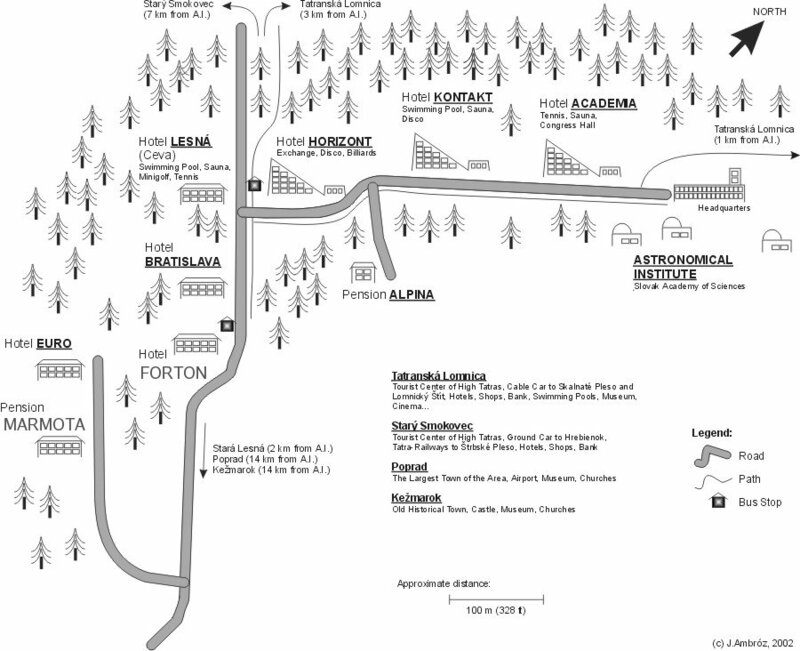 See the sketch of the local area around the institute headquarters, guesthouse Marmota and hotel Forton and the map of the Tatranska Lomnica village. - please come with your oral contribution either on CD, DVD or USB memory stick, or on transparencies. US participants: organizers will cover your accommodation and breakfast directly. You will be provided by 686 Slovak crowns per day for local expenses - you have to cover price of your lunch and dinner using this money. This money will be given to you just after your arrival to venue of the workshop. Participants from other countries (expect exchanges): it is expected that you will cover your travel, accommodation as well as local expenses by themselves. Please pay for your accommodation directly in the hotels (only Slovak crowns and credit cards are accepted, no EUR, USD, travel checks). Final prices: 990 Slovak crowns for bed & breakfast, lunch - 250 Sk. (Notice : 1Euro ~ 37.50 Sk, 1USD ~ 29.30 Sk, Sk = Slovak crown, 7/9/2006). Lunch: lunch is organized for all participants together for all 3 days in hotel Forton. You can buy tickets for the lunch during registration on morning Sept, 13 (price 250 Sk per day). Dinner: Participants are free for organising their dinners in the hotels and restaurants nearby the institute or in Tatranska Lomnica. From hotels around the institute we can recommend e.g. hotel HORIZONT, hotel KONTAKT, hotel FORTON. In Tatranska Lomnica it is worth to visit restaurant 'STARA MAMA' or reastaurant 'GAZDOVSKA IZBA', pizzeria 'BEATRICE' - all are located near the train station. For a coffee or cake we can suggest 'TRIO CAFFE' directly at the platform of the train station. Exception is Friday, Sept 15, when closing dinner will be provided for all participants free of charge in the hotel TULIPAN at Tatranska Lomnica. Coffee breaks: coffee, mineral water and biscuits will be served in the entrance hall of the institute headquarters.